أ ُ خذت قياسات المنتج باستخدام المقاس 11 ، عرض B – متوسط. يرجى ملاحظة أن القياسات قد تتباين بحسب المقاس ". I got these for my husband after getting him the Skechers golf shoes, that he loves. He went to his foot doctor while wearing these shoes, and the doctor told him to take these shoes off. She proceeded to take the shoe apart and examine it thoroughly. The foot doctor said she was extremely impressed with these shoes and would start recommending them to her patients. She used to tell him to wear New Balance but after seeing how well the Skechers were made and the support they offered, she was going to start telling her patients to get the Skechers shoes instead. She said she had heard about Skechers but never examined a pair. Looks better than it is comfortable. As a 6 mile walker I expected these shoes to be what Skechers are known for...comfort. The are anything but comfortable. Not only are they a heavy shoe but they lack cushion in the sole which is what I was hoping for. I walk on both pavement and sidewalk so it's almost like I'm walking in socks. There is NO shock absorption at all. However, after visiting the local store for cushioned inserts this problem was solved. Don't get me wrong, the shoes are attractive and okay for walking around without a fast pace. But if you want a shoe that feels like walking on marshmallow's then this is NOT your shoe. Instead of returning these like I should I'm just going to keep them as "knock around" shoes and I'll go back to another brand. There's always a risk of buying items without trying them on so in this case the brand name Skecher's didn't hold their reputation. I work as a cashier and a warehouse type environment where the flooring is cement and I am constantly on my feet all day. I was wearing regular running shoes, but after awhile my feet began to hurt after a few hours. I wanted a athletic-type shoe that looked good but also was comfortable and sturdy. 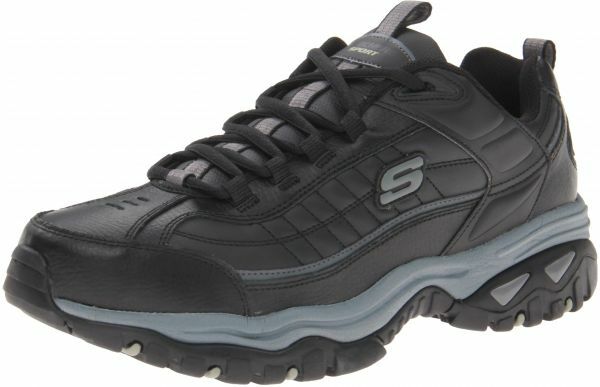 After wearing these Skechers Energy Afterburn shoes, about 30 minutes I could tell a major difference on how my feet felt on the cement floors. After work my feet did not hurt as much as wearing regular running-type shoes. I also noticed these shoes gave my feet an extra bounce, almost like the same effect you get from Reebok Zigtech shoes. I tried wearing my Reebok Zigtech at work. They are great running shoes, but not good work/walking shoes. With these shoes you get comfort plus the propulsion like the Reebok Zigtech shoe. I purchased these shoes on January 25, 2016. Overall, these are very nice shoes. I am giving them 4 stars, but I could almost give them 5 stars and certainly would consider giving them 4 1/2 stars if I could. These are not soft, cushy shoes, but they are well-made, even rugged, and support my feet. They are overall comfortable. My only real problem with these shoes is that I ordered the size I always wear and have worn for years, but yet these are slightly long, possibly slightly wider than normal too. As a result, if I just wear them around the house, I don't notice any problem. However, if I go on a walk in our neighborhood that has slight hills, I notice my feet moving a bit in the shoes and that movement creates friction that makes my feet hotter as well as irritating them a bit. On August 7, 2016, I purchased these shoes again in a different color and 1/2 a size smaller. This new set seems to just right. I haven't tested them as much going on walks in my neighborhood, but when I have, I do NOT have the same problem(s) that I have with my original pair.